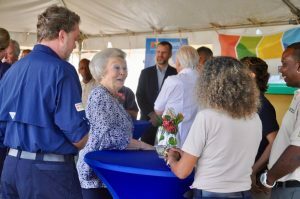 Kralendijk – Princess Beatrix paid a visit to Bonaire this week. The working visit focused on culture, nature and young people. 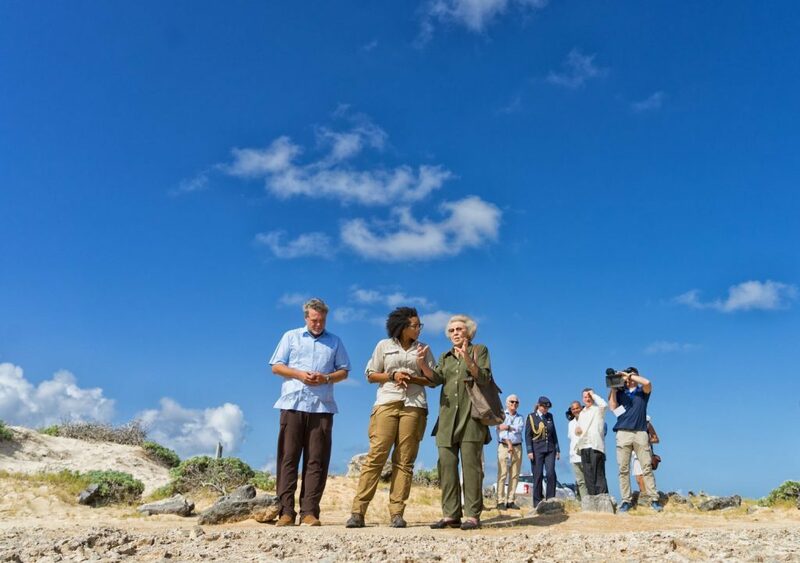 It was at the invitation of the National Parks Bonaire Foundation (STINAPA Bonaire), a non-governmental organization responsible for the management of the national parks on Bonaire, that the former Queen spent 3 days on the island. STINAPA is a member of the Dutch Caribbean Nature Alliance (DCNA), of which the princess is patroness. 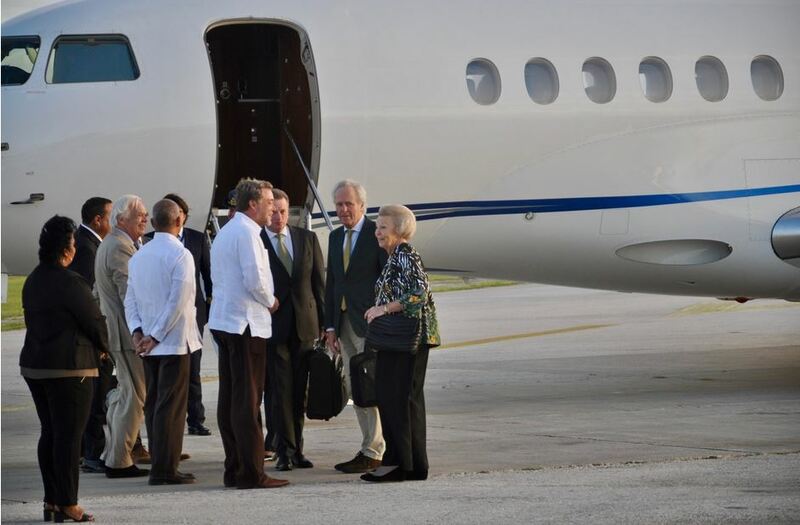 The princess was received at the airport by various dignatories, such as Island Governor Rijna and Interim Kingdom Representative Jan Helmond, as well as Stinapa Representatives. 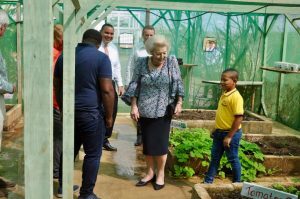 Princess Beatrix was greeted by various dignitaries and representatives of STINAPA, among others Board President Delno Tromp and Director Arjan de Wolff. Photo ABC Online Media. The working visit of the princess started early in the morning at STINAPA’s headquarters, where she was warmly received. Here, she got an explanation about the management and protection of the nature parks on Bonaire, namely the National Underwater Park Bonaire and the Washington Slagbaai National Park. After STINAPA, a visit to the Kolegio Strea Briante, a school for special education, was on the agenda. 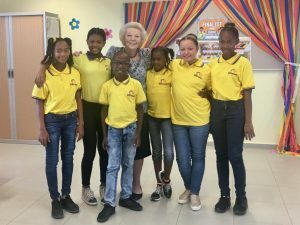 The school is the winner of the first UNICEF Children’s Rights Film Festival in the Caribbean and because the princess is the patroness of the Dutch Unicef ​​Committee, this visit could not be missed. The princess was received by a line of children who sang the school song. First she visited the handcraft classroom. Beatrix watched the winning video together with the children and the children then sang a song for her which they combined with a dance. The princess stood among the children and did not hesitate to join the dance. Beatrix gave all children a hand where one girl asked if she could give a hug. In response, the princess gave the girl a high five. Then the princess walked to the greenhouse of the school where she got an explanation about the vegetables that are grown there. The mint she liked very much. Finally, the princess went to the kitchen of the school where children learn how to cook and prepare healthy food. Then there was a panel discussion in which Julia Marisol, the 20-year-old ex-junior ranger, made an impression. 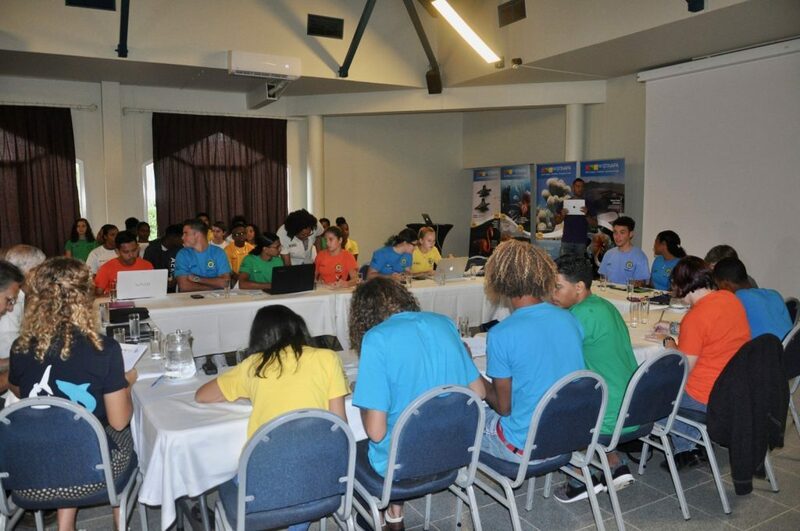 Her main position was that the youth should learn more about nature because they are the future of the island. “I may be the next director of DCNA”. Which made the room laugh hard and her position was strengthened. Probably the highlight of the Princess’s work trip: Washington Slagbaai National Park. Here too, the princess was warmly received by the board. The park was established in 1969 and covers 5643 hectares. This makes it the largest National Park in the Caribbean Netherlands. Beatrix first got an explanation about a restored aloe vera oven. It was striking that the princess told that she knew the healing power of the plant too well. After a knee surgery, she herself cut aloe vera leaves and used the juice to heal the wound. Then the party moved on to Salina Matijs, a salt lake. Biologist Roxanne was ready to give an explanation at every stop. The next stops were Playa Chikitu, Seru Grandi and Playa Kokolishi. The princess got to see flamingo, warawaras and of course goats. The latter kind only causes problems in the park. Hòfi Kultural was on the afternoon program; a cultural residents’ initiative made possible by the Oranje Fonds. At Hòfi Kultural, in the Antriol district, residents can meet and get to know each other better by practicing art together. The atmosphere was cheerful and relaxed under the brand new Panapa. A group of elderly people made music and another group did a traditional dance. The princess was also allowed to reveal a work of art on the wall. 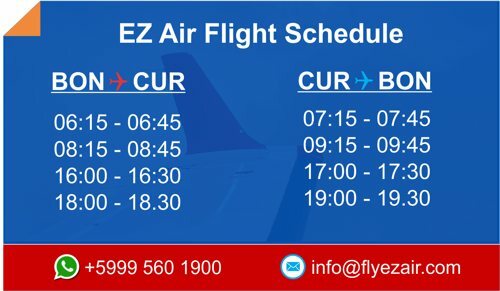 After this, the tour starts with various activities and sights. First she passes a group of children who did a Masquerade. 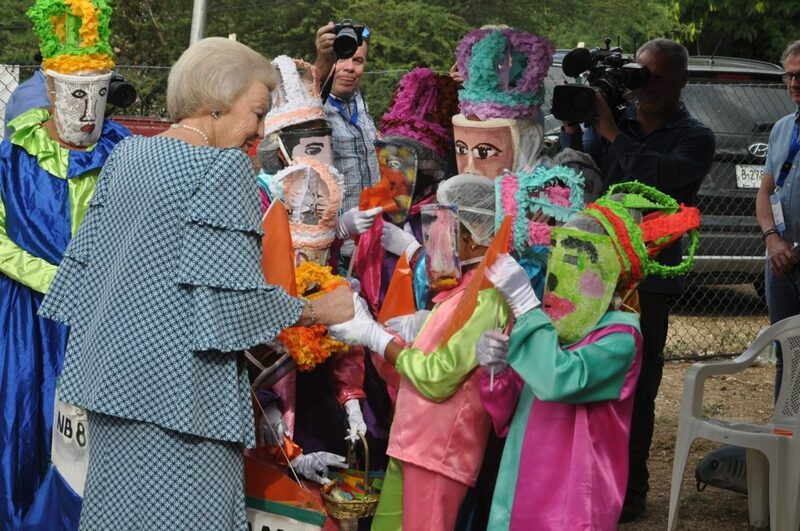 Beatrix clearly enjoyed the children, their costumes and all cheerful colors and dances. In addition to the Masquerade, Beatrix also explained a number of traditional musical instruments that the elderly teach to the children, such as the Kuarta. When the tour went on, there were children who paint calabashes. The princess clearly liked the handicraft and stayed a little longer. After a couple of minutes it started to splash, but the princess did not mind that. She cut off an offered umbrella and walked back to the palapa. A proud, passionate woman who clearly loves her time on Bonaire. The last morning for Princess Beatrix. She visited the Plaza Resort to attend a debate of the STINAPA Junior Rangers about the sustainable development of Bonaire. The children were divided into two teams, the “benefit” and the “nuisance” team. The children had an entire debate with all kinds of strong arguments and counter arguments that were well substantiated. The “benefit” team won and afterwards the princess went to the two teams to talk to the children. 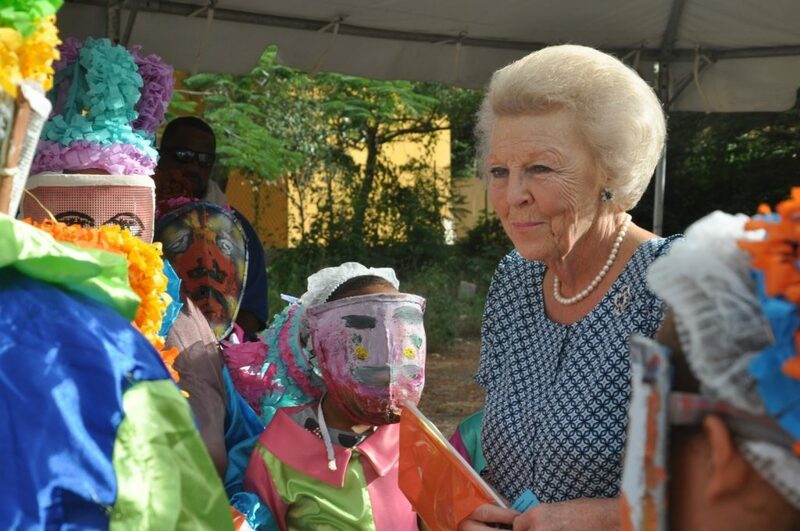 Princess Beatrix listened carefully to the debate between the Junior Rangers. Photo: ABC Online media.